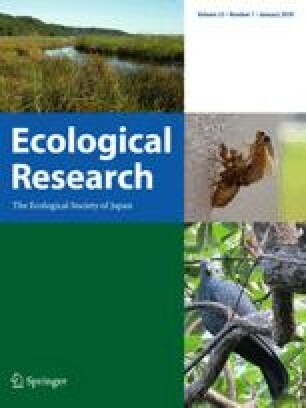 The reproductive characteristics and feeding conditions of the spider,Nephila clavata, were examined at some urban and non-urban woodland sites. More than 80% of females were gravid by late October in both non-urban and large urban woodlands, whereas only 10%–30% were gravid in small urban woodlands. The expected number of eggs per female in mid-October was also lower in the small urban woodlands, although body length was not reduced. This suggests that reproductive failure was not caused by food shortage during the nymphal stage. Relative food consumption rate, prey size, biomass and size of potential prey during the adult stage all tended to be lower in small urban woodlands. These results suggest that decreased reproduction ofN. clavata in small urban woodlands is caused by food shortage during the adult stage, particularly a shortage of large insects.